Yom Tefillah for Cholei Yisroel - Kapayim - Donate Now! TODAY! once again, for the 3rd year, thousands of men, women and children across the spectrum of Jewish communities throughout the world will unite for an auspicious day of tefillah and tzedakah for choilei yisroel. Tens of thousands of yidden will say - Choilei Yisroel - I'm here for you! Neighborhood hosts will gather with their neighbors and friends to complete sefer tehillim and donate towards Kapayim, men in their workplaces and kollelim, children of all ages in their schools, yeshivos, and chadarim - to beseech rachmei shamayim for the kinderlach in our communities who suffer the effects of medical illness. Whether the patient is a child or parent - the entire family unit is affected. 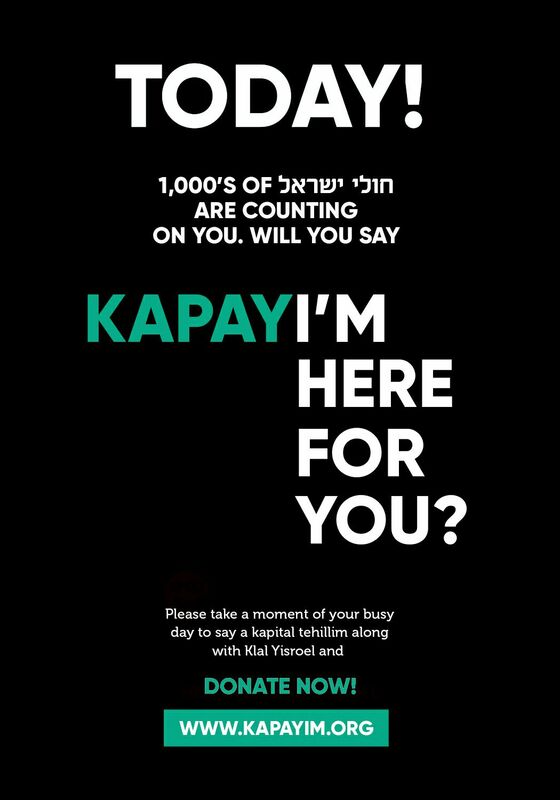 Kapayim says to choilei yisroel- I'm here for you, 365 days a year. Kapayim is there to ease the suffering, and enable the home to function as normally as possible. Kapayim sees the need, hears the silent (and not so silent) cries, and understands how desperately the tefillos are needed. By sponsoring a sefer of tehillim the awesome powers of tefilla and tzedaka are combined, on a day that will surely bring yeshuos and refuos to all participants, and enable the dedicated members of Kapayim's vast network of shelichim to continue providing support for choilei yisroel in our communities every single day. Please contribute generously, as the funds are desperately needed.